It’s that time of year again for Team USA to assemble and start narrowing down the expanded roster (currently consisting 41 players) towards the 12 necessary for the 2016 Olympics in Rio de Janeiro. The extended roster consists of 34 players: LaMarcus Aldridge, Carmelo Anthony, Bradley Beal, Tyson Chandler, DeMarcus Cousins, Stephen Curry,Anthony Davis, DeMar DeRozan, Andre Drummond, Kevin Durant, Kenneth Faried, Rudy Gay, Paul George, Blake Griffin, James Harden, Gordon Hayward, Dwight Howard, Andre Iguodala, Kyrie Irving, LeBron James, Kyle Korver, David Lee, Kawhi Leonard, Damian Lillard, Kevin Love, Paul Millsap, Chandler Parsons, Chris Paul, Mason Plumlee, Derrick Rose, Klay Thompson, John Wall,Russell Westbrook and Deron Williams. There are seven new invitees: Harrison Barnes, Trey Burke, Jimmy Butler,Mike Conley, Draymond Green, Tobias Harris and Victor Oladipo. Besides them, Jerry Colangelo and Mike Krzyzewski haven’t ruled out calling up former members of the 2008 and 2012 teams, which means Kobe Bryant, Dwyane Wade and Chris Bosh might still make an appearance. Some players, like Love, Durant, George and Irving won’t be expected to participate in the non-contact workouts leading up to an all-star game on August 13, their presence at the UNLV campus will be required. Choosing 12 out of this group is going to be difficult, so getting some players to drop out will actually make life easier and simpler for Colangelo and Krzyzewski. 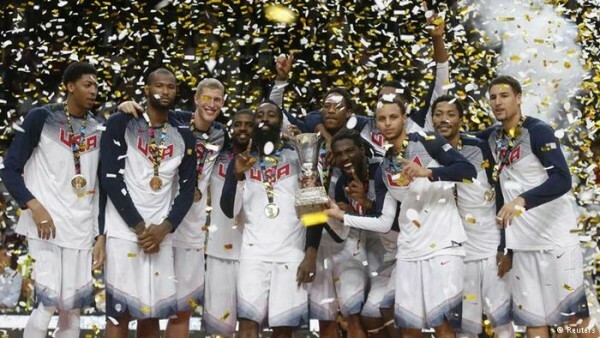 Team USA has won the gold medal/first place in the last four major tournaments they’ve participated in: The 2008 Olympics, 2010 World Championships, 2012 Olympics and 2014 World Championships. While players usually don’t always jump on the opportunity to play in the world championship, Olympics are usually hard to turn down, especially for those without a gold medal.